A main challenge facing adaptation science is to improve our theoretical understanding and predictive capacity. The purpose of this is to guide adaptive forest management. 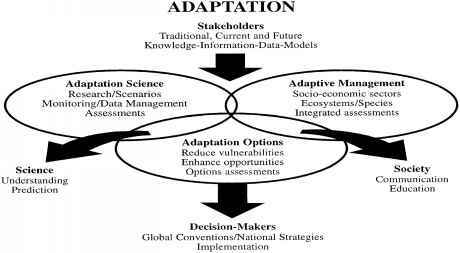 Adaptive management serves to reduce vulnerabilities to and enhance opportunities of climate variability and change. The IPCC (Watson et al.,1996b) defines vulnerability as "the extent to which climate change may damage or harm a system. 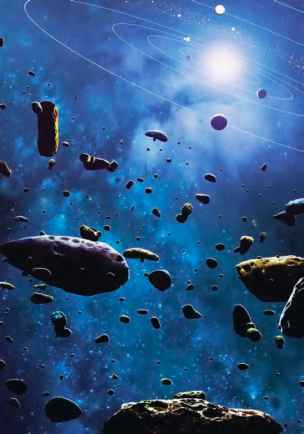 It depends not only on a system's sensitivity but also on its ability to adapt." If a system is sensitive to climate and a climatic stress (either positive or negative) occurs, then damages and/or benefits will result. However, even if a human or natural system is sensitive to climate, it may be so well adapted or able to adapt that few or no damages occur. Conversely, if a system is maladapted and is climate-sensitive, climatic events of a certain type may result in irreparable damages. Forests serve as an excellent example of this latter case, when the rates of change of the future climate far exceed the historical rates of forest migrations and disturbance losses from forest fires and other insects, diseases and where population and land-use changes are expected to significantly change, as well. • What do we understand about the adaptation of human and natural systems to past, present and anticipated future climate variability and change? • What is the ability of the scientific community to accurately represent adaptation processes in impacts models and assessments? What are the best ways of modelling adaptation? • How are the risks of climate variability and change perceived (e.g. by decision-makers, by managers, by those responsible for adaptive management)? • The use of adaptation options is part of a broader process of the adoption of innovation, which is a component of social change. What is our understanding of the process of social change and of the adoption of innovation and new technologies? • How well adapted are activities or systems? What options exist or are needed for developing forest-monitoring systems to determine how well activities or systems are adapted? Figure 1. Adaptation cycle through space and time (Wheaton and MacIver, 1999). regarding adaptation, to stimulate ideas, and to explore the linkages among parts of the adaptation cycle. The adaptation cycle model is normally characterized as iterative, dynamic, interconnected, non-linear, and likely chaotic. This cycle reminds us that research can begin with examining the disturbance and impacts, as has been traditionally done, or it can begin directly with adaptation assessments. But more importantly, larger forest ecosystems have, on the one hand, a buffering capacity that will ameliorate the direct effects of climate change, especially the rates of change, whereas, in comparison, other forest ecosystems, such as individual trees and woodlots will likely be maladapted immediately (i.e. heat stress, insect outbreaks and so on). For example, the onset of a drought may be gradual and can be difficult to detect, but a forest fire or insect onset is sudden. Or, forests, including woodlots and trees, surrounded by highly impacted landscapes become more vulnerable, even if the species within the forest have the potential of adapting to the future climate. Under these circumstances, the erosion of the buffering capacity of the forest can be abrupt. Figure 2. Adaptation framework (Wheaton and MacIver, 1999). capacities, impact assessments, data and information needs and knowledge of the forest climate.